David Lynch and Mark Frost have broken the television. Like some living, breathing, electrified nightmare, Hour Eight starts with Ray shooting Mr. Cooper, who is then visited upon by the most startling set of engine oil-scorched ghosts whose otherworldly movements and nefarious shamanism bring him back to life. Flashback to 1945 and a nuclear test site, where Lynch then employs cinematographer extraordinaire Peter Deming to slo-mo pan in on a burgeoning mushroom cloud before going deep inside it to the atom-splitting core. It’s a completely mesmerizing mosaic of meditative horror that could only be done on film (or is this digital, well, you get my drift…it’s purely and wholly cinematic) that seems like the rebirth (or afterbirth) of the artistic medium, though somewhat reminiscent of those fantastic sequences from the close of Kubrick’s 2001 and the middle of Malick’s Tree of Life. The fifteen minute sequence, despite its quasi-eerie familiarity, is completely beyond words and comprehension, and pardon the lame cliché, it will blow your mind. Meanwhile, across that vast dark ocean Cooper once got a peek of before becoming Dougie in an earlier hour…we come upon…the White Lodge? Here our good benevolent friend, the Giant (aka ???? 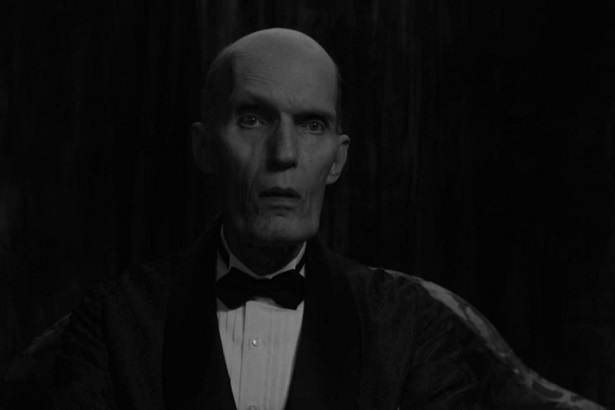 and played by Carel Struycken), in an attempt to combat the evil globe containing Bob presumably given its opening into our world after the atomic bomb was set off, conjures up some goodness (in the form of Laura Palmer in a golden starry sphere) that is then transplanted to planet earth (and presumably Twin Peaks) by a hopeful and stunningly dressed lady in a theater. Back to those engine oil scorched chaps…apparently it took them until 1956 to get their act together, and there in New Mexico they creep upon innocent victims asking, “Gotta Light?” before infecting the airwaves with a most creepy poem that begins, “This is the water…this is the well…” The whole thing is so dreadfully 1950’s black-and-white horror movie dreamy, with two teens walking home, and the girl (exquisitely photographed sitting on her bed listening to the radio with her window open to the hot night) dreaming about that innocent first kiss they just had while listening to The Platters, “My Prayer”. Then, of course, it becomes a nightmare, as that very radio station playing The Platters is the one taken over by Mr. “Gotta Light?”, and while his evil mantra of a poem sends all listeners to sleep, some ungodly moth-like creature that hatched from an egg hops through the open window, onto the girl’s bed, and crawls into her mouth. So yeah, that ALL happened…and watching it broke the television and will be sure to fuel nightmares for years to come. So, like, thanks for that, Davey Boy. What say you, fellow Peakers? What WTF moment will give your nightmares from Hour Eight? This entry was posted in Art, Pop Culture, Psychology, Television, Twin Peaks - The Return: Complete Hour by Hour Guide and tagged Agent Cooper, Atomic Bombs, Bob, Carel Struycken, Convenience Store, David Lynch, Horror, Kyle MacLachlan, Mark Frost, Mushroom Clouds, My Prayer, Nightmares, Peter Deming, Showtime, The Atomic Age, The Black Lodge, The Giant, The Platters, The White Lodge, Twin Peaks. I couldn’t wait to read your recap of this episode! Such an odd episode. I will say that the 16 year old in me squealed with delight at watching NIN at the roadhouse! Trent Reznor is still dreamy! This episode was such a strange and mindblowing work of art. Bravo Lynch and Frost.